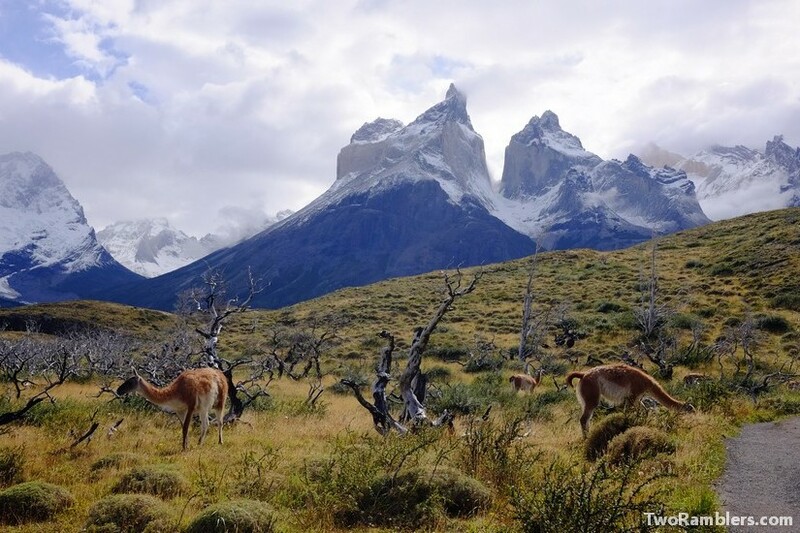 Any guide book on Chile or South America lists trekking in the national park Torres del Paine as one of the must-do activities. There are two main options when it comes to circuits that are followed. 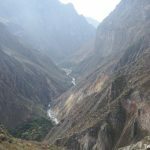 The ‘W’ which takes three to five days and follows a zigzag route to the south of the famous mountain formation or the ‘O’ circuit which does a full tour around the mountains during eight days. We decided to disregard general practice and followed an itinerary that we like to call the Y. 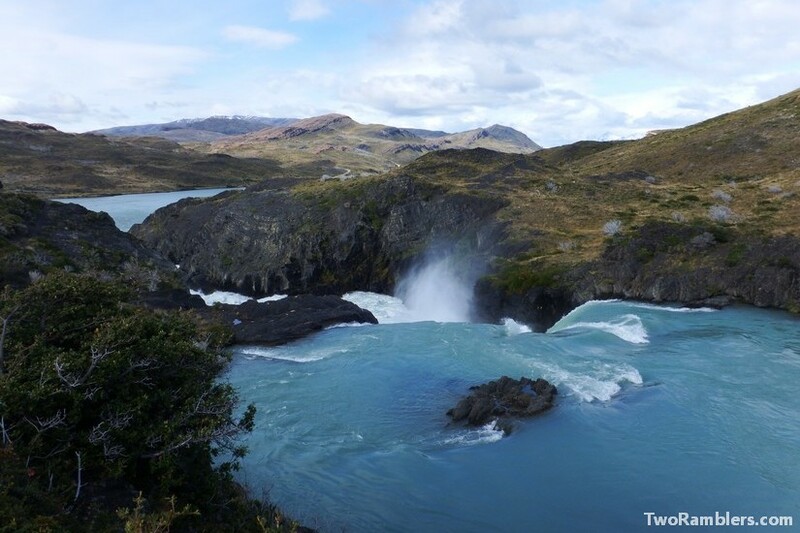 Being such a famous destination, Parque Nacional Torres del Paine can get very crowded. 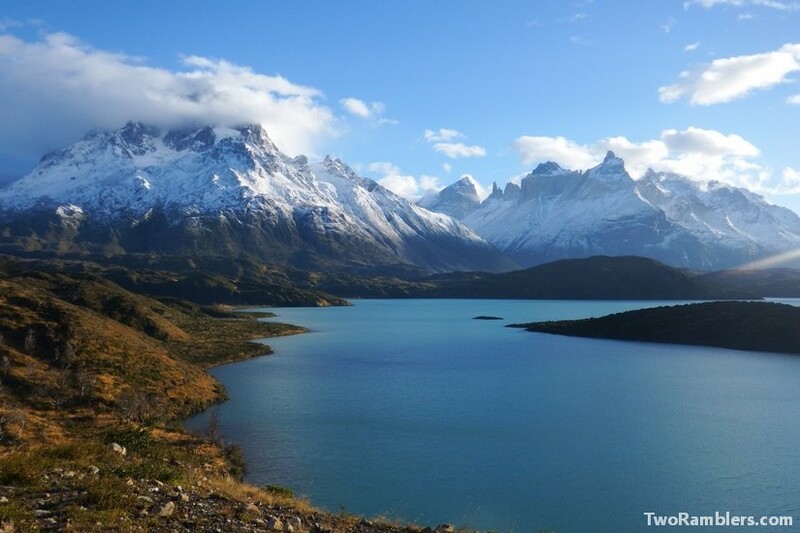 Especially in January and February, when most of South America is on their big vacation, campsites are fully booked. Along with the high number of visitors come many rules to preserve the park and high prices. There is an entrance fee to be paid, wild camping is forbidden, plus campsites are comparably expensive and need to be booked well in advance (which we had not done). 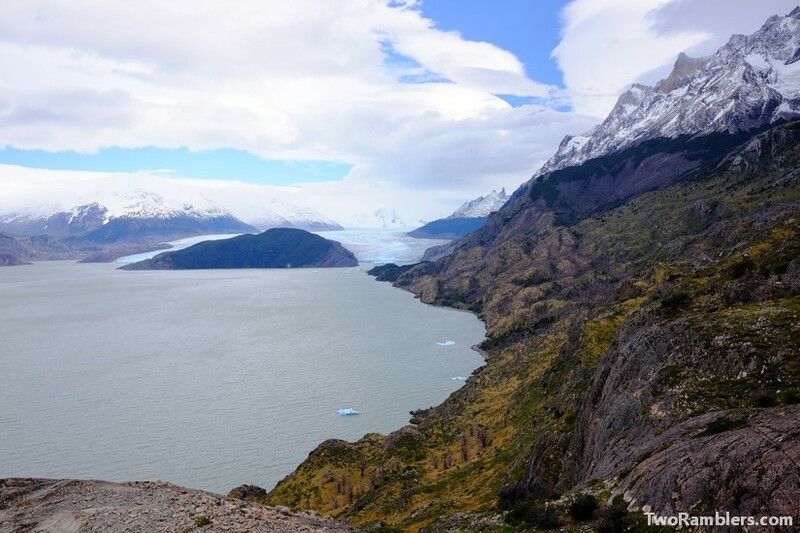 Quickly we understood that trekking in Torres del Paine would be completely different to the remoteness and freedom we had experienced during our first two hikes in Patagonia on Isla Navarino and to Cabo Froward. Still, we decided to give it a try. We had heard from so many fellow travelers about the stunning views in the national park and that we should not miss out on it. Sort of last minute we booked two nights at the Paine Grande campsite. We used it as a base camp to discover the park on day hikes. We reached the park from Puerto Natales. The day before we had hitchhiked there from Punta Arenas and the young Chileans who had given us a ride also offered to take us into the park the next day. We registered at the park administration, paid our entrance fee (CLP 21,000 per person) and explained our plan for the next days to the park rangers. 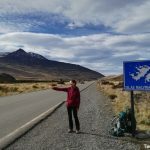 And we got some bad news: we were not allowed to use a walking route towards the Paine Grande camping site as we had planned. The rangers explained to us that this route could only be walked in one direction, to get away from the campsite. Instead we would have to take a catamaran to reach the our reserved camping spot – costing almost as much as the park entry. Unhappy about these additional costs and angry that there was no information about the one-way nature of the hiking route on any of the maps we had seen, we reached the pier of the catamaran. There were a few hours to spend before it would leave, so we decided to go on a walk to a view point close by. 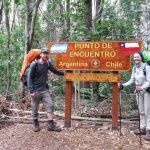 After these negative first impressions the hike to Mirador Cuernos brought back our spirits. The walk first led us to a waterfall. We watched a clear, blue lake turn into white, wild splashes to meet another lake. Further down the route we got very close to a group of Guanacos strolling around, unafraid of the many tourists walking by. 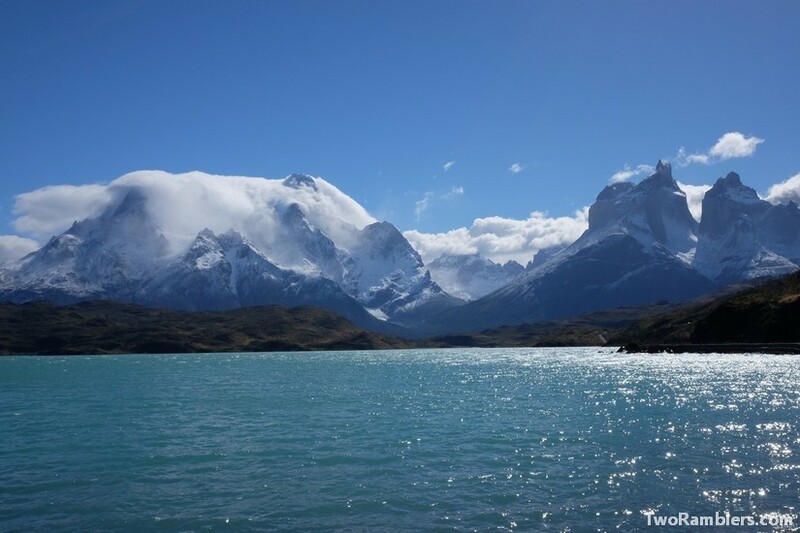 However, the main attraction were the stunning views over the Paine Grande mountain range and the blue waters of Lago Nordenskjöld in the front. Back at a café close to the catamaran pier we got to see some more animals. 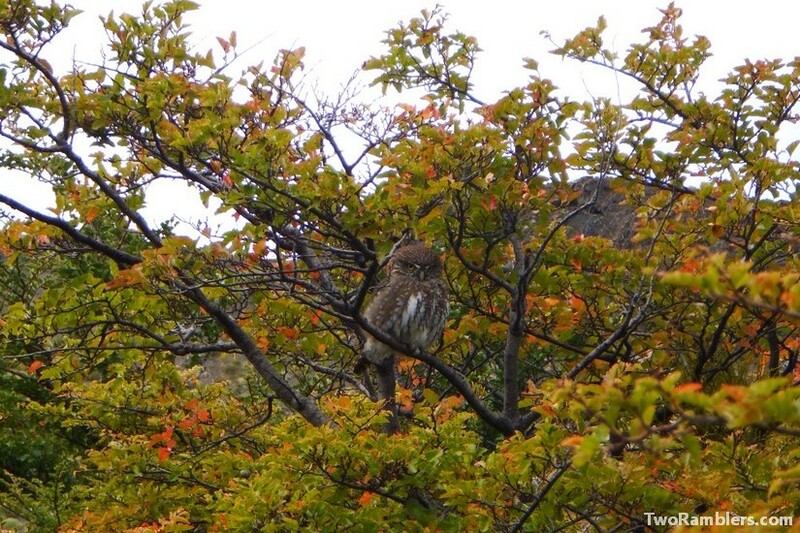 Wildlife in Patagonia seems to be rather unimpressed by human presence. 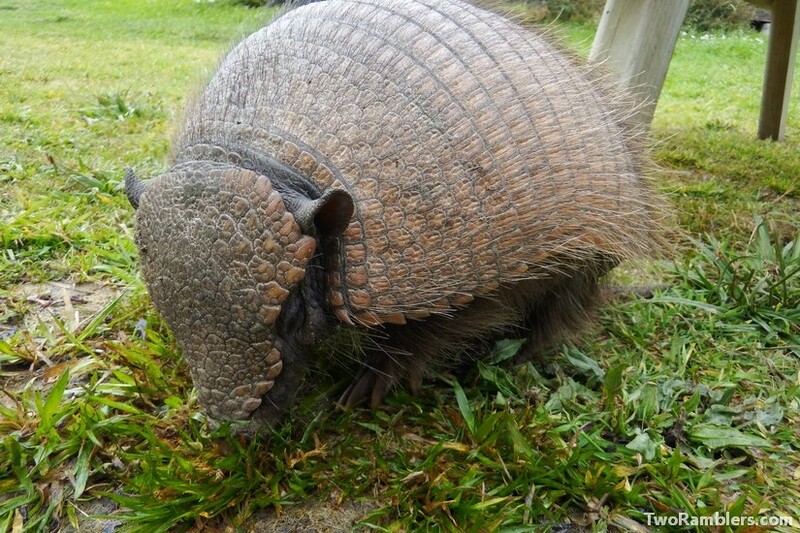 We watched an armadillo searching for leftovers under some picnic benches and an owl resting in a tree. The catamaran was short but we got another good view over the peaks surrounding us. 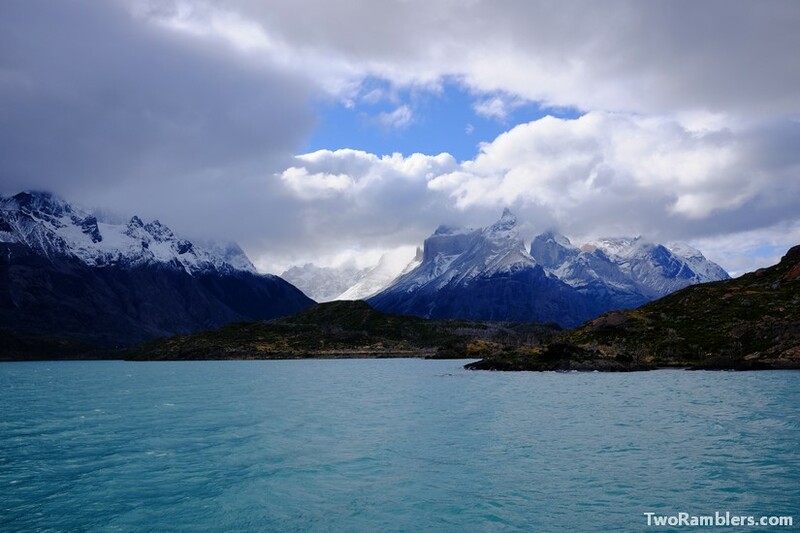 The waters of Lago Pehoe were of a beautiful turquoise. Despite some cold winds we enjoyed the few sun rays coming through the thick clouds above us. As we got off the boat at Paine Grande we were surprised by the probably 150 persons waiting to get on the catamaran. We had only been with ten other tourists on the boat and had assumed that there would not be so many people in park during low season. The campsite was also quite busy. We tried to find a good spot for our tent, protected from the heavy Patagonian winds but accepted that it would not be possible. We were glad about the warm ‘quincho’, a big wooden cabin with tables and benches and a place to use our camping cooker. During the three days at the campsite we had many interesting and fun conversations with other hikers in the quincho. This second day started with strong winds. As we walked uphill towards a first view point the wind blew hard in our faces, pushing against us. It was as if the wind wanted to keep us from reaching the glacier to which we were walking. There were many people on the path. When we reached the first lookout and got a view over Lago Grey the wind had calmed down. From this far away the Glacier Grey looked endless as if it met the horizon. On the path along the lake we could watch ice bergs slowly drifting away from the glacier. We also saw the remaining damage of one of the forest fires from a few years ago. Along our route only white trunks of trees were left. After a good four hours we had reached the second viewpoint, very close to the glacier. We sat down for lunch with a view on some icebergs stranded on the shore. At first they didn’t seem to move but as time passed it was as if we could see them melt. 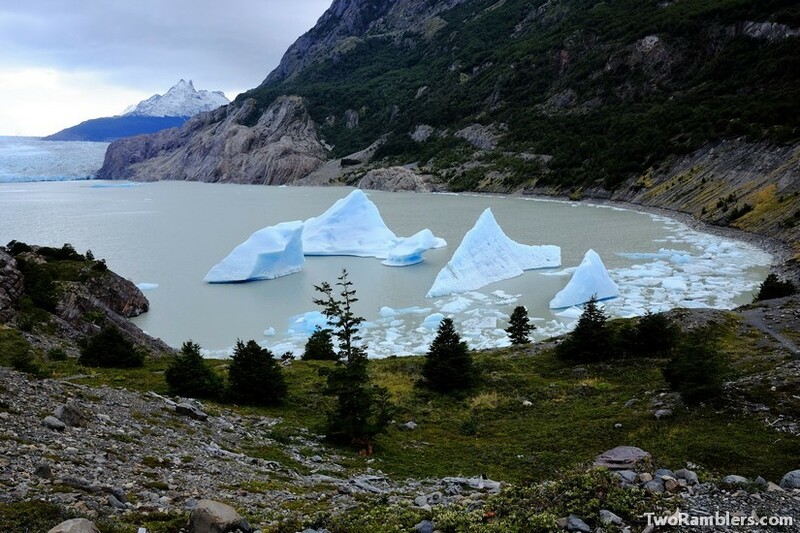 Despite the cloudy sky, the glacier ice was of an incredibly strong blue. Kevin said it was as blue as the sky. Franziska was convinced that the ice was bluer than any sky she had ever seen. The way back to camping Paine Grande went faster as we no longer stopped for all the views. The wind was strong again, now blowing from the back, pushing us forward. Back at the campsite we heard warnings that over night the wind would become even stronger, reaching more then 100km/h. And indeed, at night we woke up from the noise of our bending tent. We worried that it would not withstand the strong gusts. But Kevin had fixed the storm cords very well. Unlike some of the tents around us ours was still standing strong in the morning. 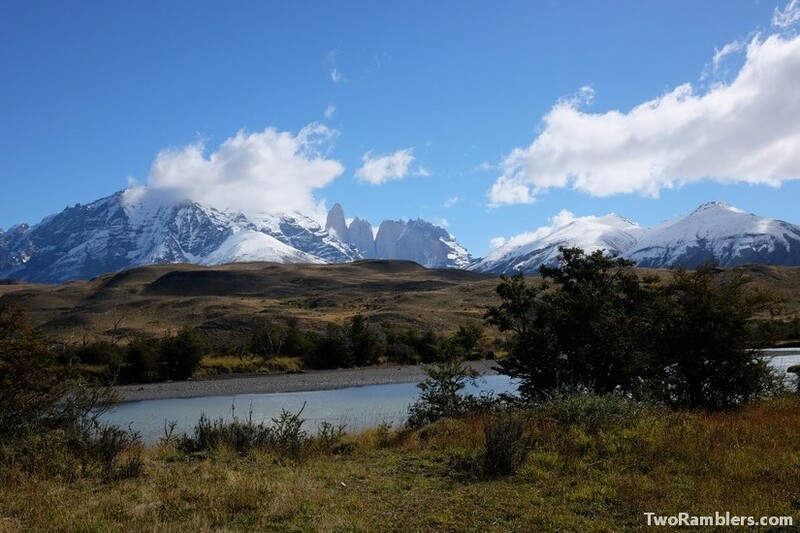 Initially, we had reserved the campsite for two days but we decided to take a look at the French Valley before walking away from the hiking routes of the national park – forming the right arm of our Y-trek. 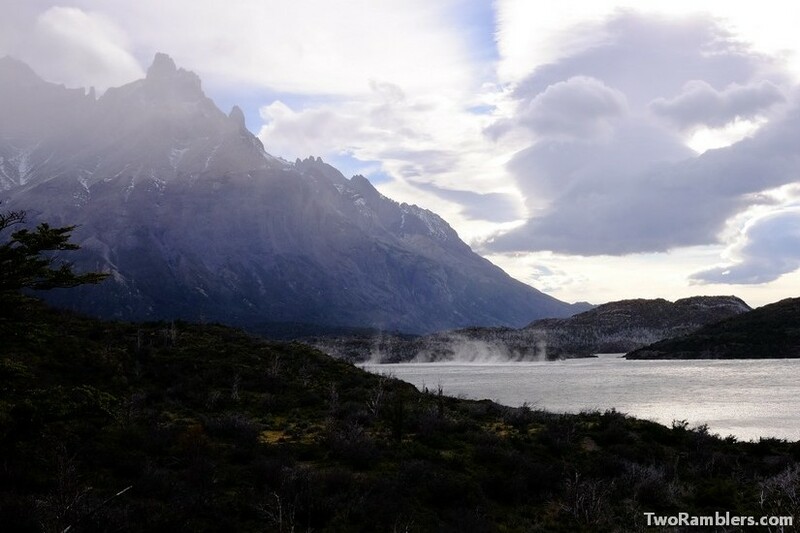 It was no problem to book a spot at Paine Grande for another night. The wind came from all directions as we walked towards Camping Italiano at the foot of the French valley. It was blowing hard against us, just to turn the next second to push us forward again. At some points it got so strong that the raindrops in the air actually hurt as they hit our face. Over Lago Sköttsberg the wind blew up the water into clouds, turning the water through the air forming small tornadoes. We stopped a lot to watch this spectacle. After a quick lunch at Camping Italiano – it was just too windy and wet to stay longer – we started our way up into the Valle del Francés. With the strong winds and due to some recent snow fall the last part of the walk in the valley, up to the Britanico viewpoint was closed. We decided to turn around about half an hour from Camping Italiano. We were just not in the mood to walk more with the bad weather. There was not much to see of Glacier Francés in any way because of the low hanging clouds. On our way back to Paine Grande, a group of guys with gigantic backpacks, walking very slowly under their heavy weight came our way. We had seen some of them the night before at our campsite and were surprised that they had so much stuff with them. 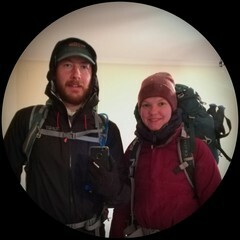 They didn’t look like inexperienced hikers that would overpack so extremely. The next hour of our walk we imagined what these guys could have in their backpacks. Loads of food for the entire O circuit? Alcohol to have more fun during the hike? Gear of street artists that they didn’t want to leave behind at a hostel? Were they carrying the gear for people on a guided tour? The next day we saw a similar group of guys in the quincho. It turned out they were carrying the food for guided tours on the W circuit. We saw one of them marking a fruit salad for breakfast for his group. He had brought a melon! In the afternoon the rain got stronger and we were happy that we had gotten back to the campsite early. The quincho filled with hikers who were soaked to the bone and still had to set up their tent. On our last day we got up very early. While the sun rose behind the Paine Grande mountain we were taking down our tent. After all the rain we had a clear sky and a free view over the mountains during the whole day. 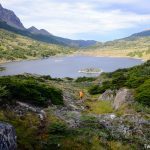 We walked south from the Paine Grande campsite, first along Lago Pehoe, then following Rio Grey. It was an easy, very enjoyable walk. There was nobody else on the route and for once we wouldn’t have to take the same way back in the afternoon. The trek was mostly flat, with big grass fields around us. We had some of the best views over the surrounding peaks. Quickly our shoes and socks were soaked from the grass that was still wet from the rain. We dried them over lunch in the sun. 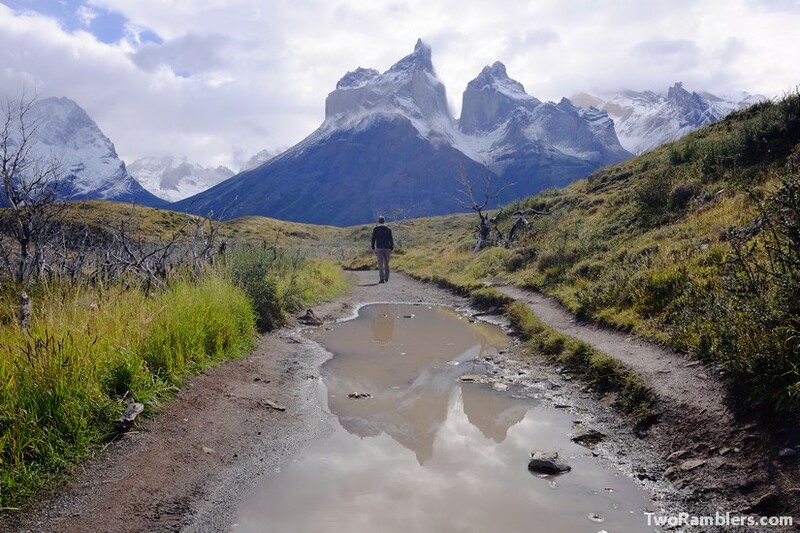 When we met the road close to Lago Toro, we got a ride from some of the many tourists who visit Torres del Paine by car. They made a few stops to take pictures that still allowed us to do some more sight seeing. In the end, we also found a car to take us back to Puerto Natales. 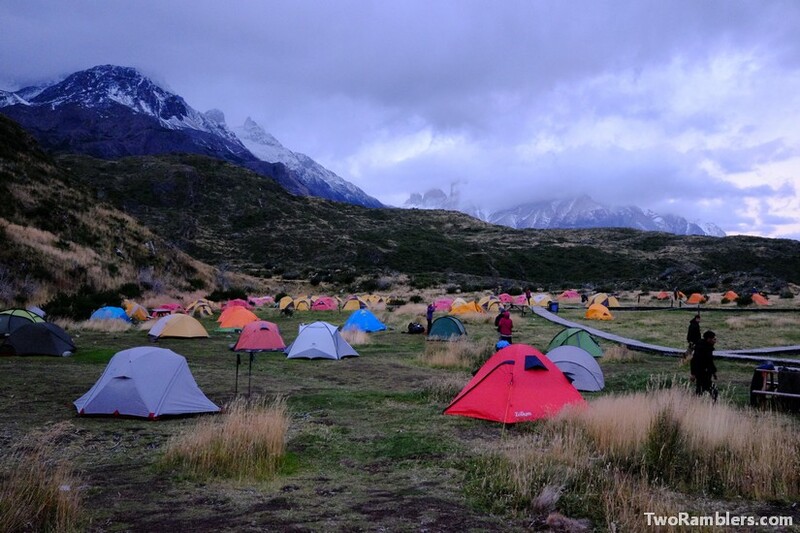 Although we visited Torres del Paine towards the end of the season, the campsites were still quite full and met a lot of people on the hikes. Nevertheless, we are glad that we didn’t miss out on the magnificent views. It’s amazing ! Your pics are impressive ! Bonne route, continuez à vous éclater !